Something has changed in 4.1 but it is the same system. Here you can see all the members of our guild. The reached Lvl and the total DKP points. You get this in all dungeons. For every 5 AP spent on a dungeon you earn 1 DKP. The here displayed personally reached DKP always remains even if you have bid in the auction. The current DKP after a bid can you see in the auction tab. A message to all costs each time 20 runes. Chairman, Vice-Charman and Officer can accept new members. 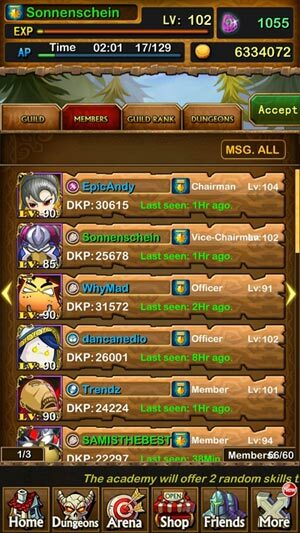 Under Guild Rank you see all guilds that have currently made ​​their Guilde public and are looking for new members. If you want to know more click on Bidding and then click the ? 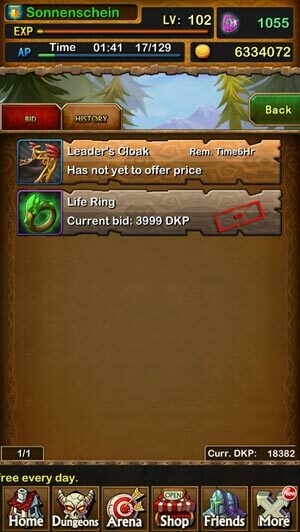 Only if you've played in the Dungeons it is possible to bid in the auction. All random equipment which drops during and after clearing the dungeons will be listed here. Attention! You see only the equipment from your played Dungeons. Do you play only in Zuhan you can't bid on the Equipment from Flameheart. Each piece of equipment is 24 hours in the Auction. You can see it on the timer next to the item. After your bid the game says 'You won' (this is a bad translation). It should rather be called 'bid submitted'. Nobody can see your bid!! Everyone has 24 hours time to submit. If you win, you get an in game message and you see it in the message board. Reset time: Sunday, first round does not take runes and it open by the system automatically. 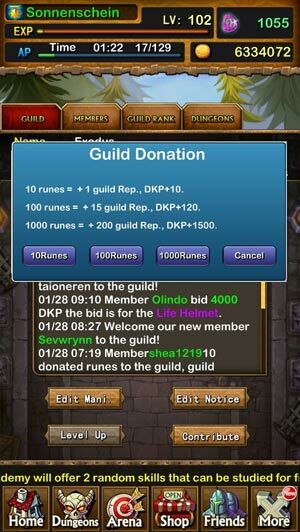 Any guild member who has purchased more than 2000 Runes or is >Lvl 90 can reopen a Dungeons. But the Chairman has to make you Vice-Chairman. Ask in chat for it. The Chairman / Vice-chairman reopened the dungeons at the moment, so that all get a chance. But remember it cost his runes and can not be required. Any activity are shown here. 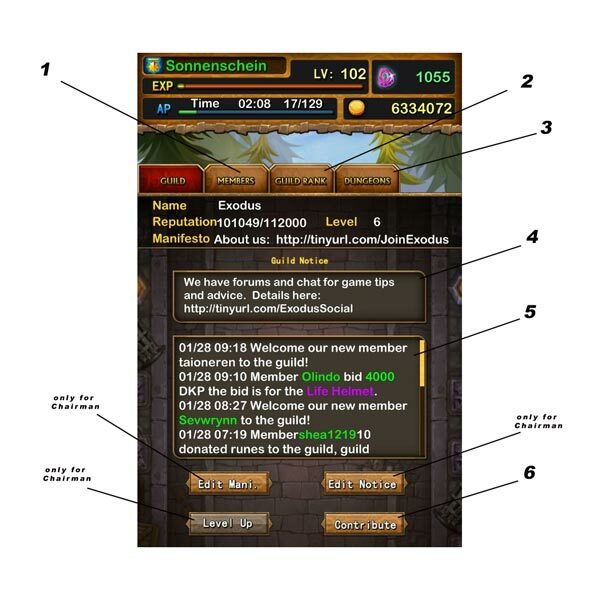 To be able to increase a personal DKP and accelerate the lvl of the guild. You can donate runes 24 hours after admission and can only be donated once a day. Runes absorbed by the system, not to the president of the pocket. What is new in 4.1? 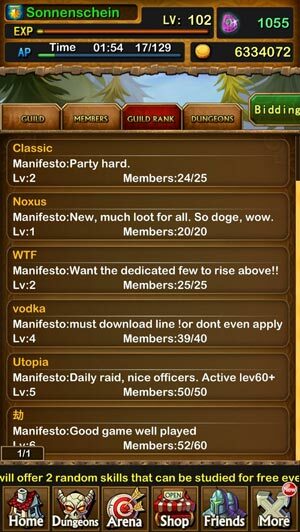 Guild President and VP can level up Guild Shop. The more higher level, the more items to purchase. The purchase limit will be refreshed at 4:00am /pst every day. Increase the times of receiving and sending AP in Friends list. 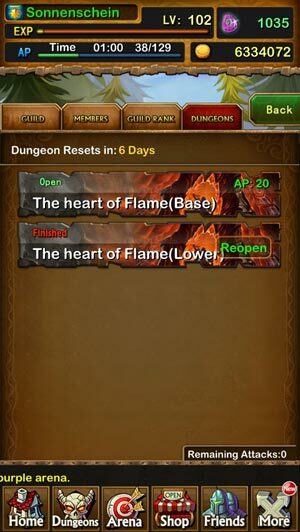 It only costs 10 runes to reset Guild Dungeon. ** After clearing Hurricane Castle, players who made more than 500K will receive 5 Justice Badges. ** After clearing Hurricane Castle, players at top 10 will receive an extra Lv.90 purple equipment piece and an extra Justice Badge. Here you can raid alone and its easier. It drops Guild Gift. The more difficult the dungeon the more generous drops!